Deco Moldings Introduces a Breakthrough in Home Renovation Products. Deco Moldings is proud to present the only customizable Raised Panel Wainscot system in the industry. 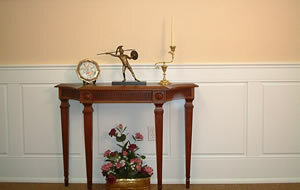 Until now wainscoting has been prohibitively expensive and could only be installed by a custom carpenter. With our new system we have dramatically reduced the cost and headache associated with installing wainscoting. After years of researching the home improvement market and fielding many customers' questions from around North America, we created a true raised panel wainscot that can be economical and easily installed by the homeowner or professional alike. Deco Moldings sells complete 8 foot kits that include all the parts required for an installation. What makes this molding combination so unique is that you can adjust the position of the vertical stiles at any point along the horizontal rail. So instead of using different sized stiles, the raised panels can be easily cut and shaped to suit the wall's dimensions, giving the project a high quality custom built look. With our easy to follow instructions and our friendly staff always ready to answer any question, your home will change from "Old" to "Bold" in just one weekend. 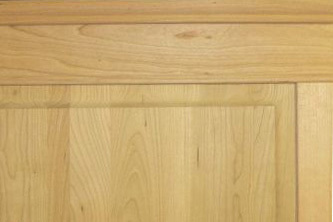 NOW AVAILABLE STAIN-GRADE WAINSCOTING KITS !